I was recently back at a garden where I did a day of rock work last summer, a short section of moss rock wall along a sloping path. 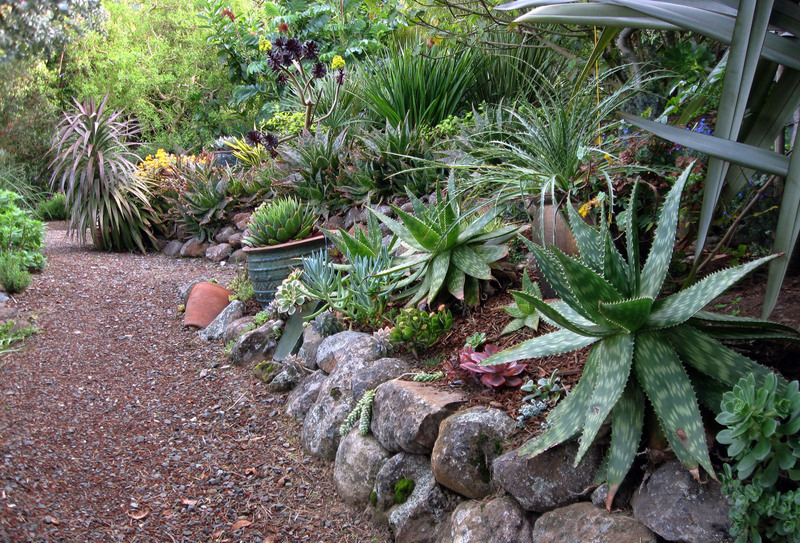 When I built the wall, the client and I incorporated a couple of cracked pots into the wall where it tapers into the slope, and then she transplanted a number of her succulents to plant along the wall and in the pots. It’s one of our only gardens in which the client is also a gardener, and it was nice to now see how her planting has begun to fill in. The plants in the cracked pots still need a little more time to spread, but I think they already look pretty cool. The wall in the background was already there, built by the company who installed the garden five years ago. 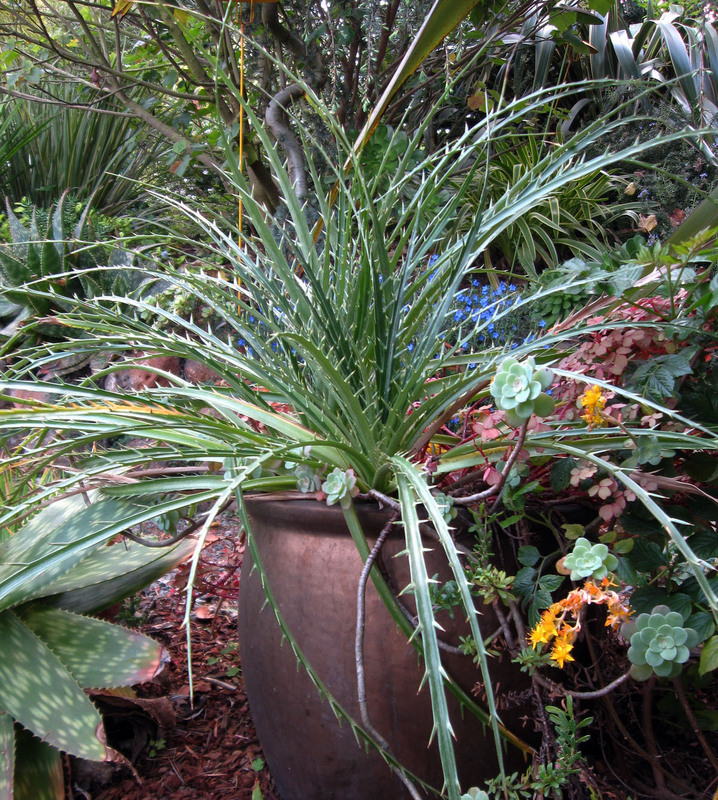 I like the choice of aloes to plant along the top of it; they do well there, and their pokiness discourages people from messing with the rocks. The garden is quite spectacular and worthy of a longer post some day. There are always things blooming and I usually take a few photos while I’m there; the shots of the swallowtail and prostanthera in my last post are from this garden. 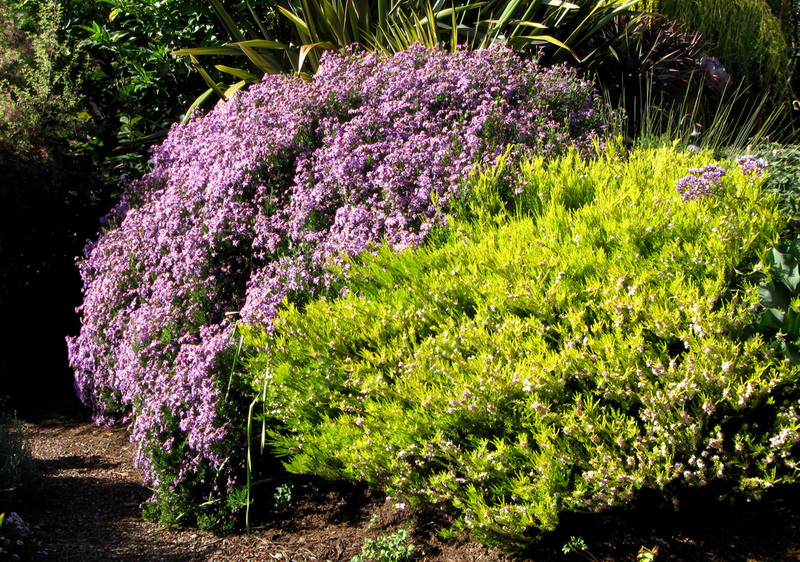 When the prostanthera is done, this member of the aster family will be in full bloom. I’m not sure what it is, but I like the look of the flower buds, and when it gets going, it puts on quite a show. Does anyone know it? 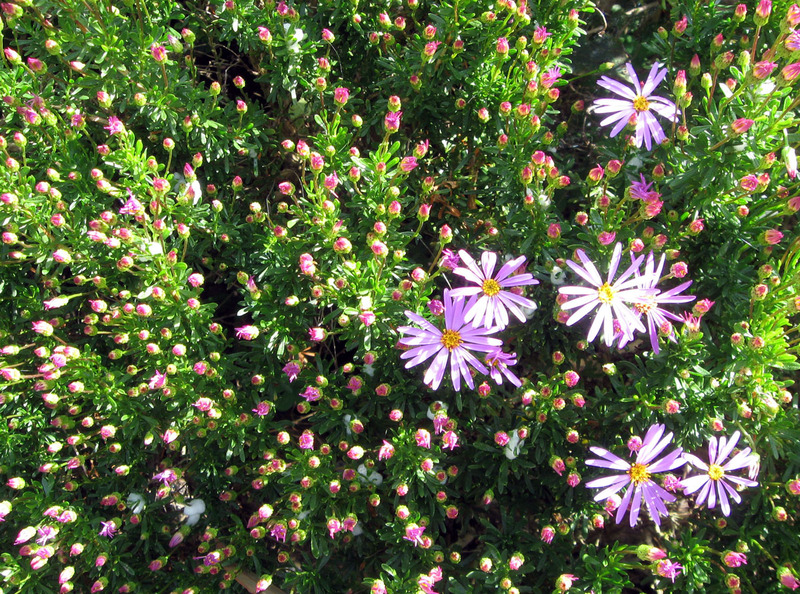 I would try to figure it out, but the aster family is mighty big. This entry was posted on Tuesday, April 6th, 2010 at 7:22 am and is filed under stone, walls. You can follow any responses to this entry through the RSS 2.0 feed. You can leave a response, or trackback from your own site. I love the wall. The garden looks beautiful! I agree, Noelle, clients who garden are the most interesting and enjoyable to work for. 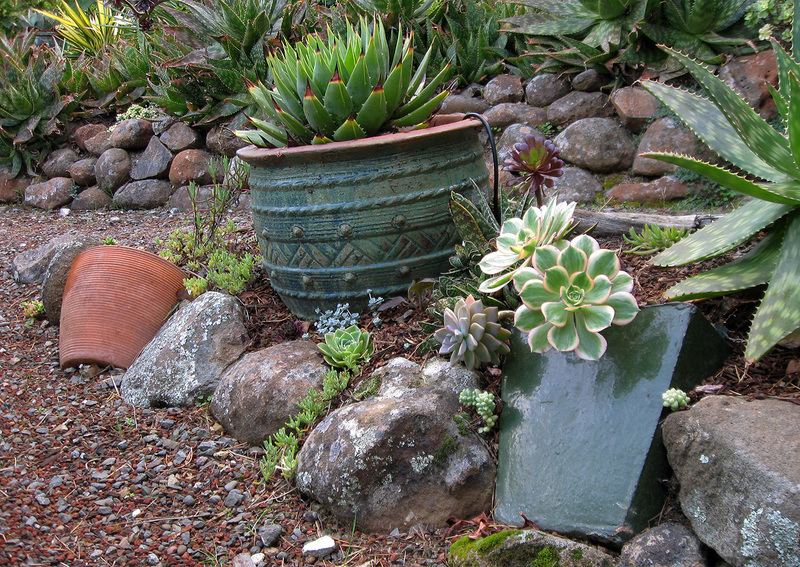 Thanks, Barbara E, on behalf of our gardener client who does the bulk of the maintenance and had the idea of the pots. It was a ll the client’s idea. She was unsure I would want to use them, but I thought it was a great idea. She has a few other things planted like that in the garden, as a way to deal with the slope. Yeah, I like when clients add more interest and variety to what I do. I’ve built a lot of moss rock walls, but this is the only one with cracked pots in it. I’m not a fan of the cars or toilets either, but I’ll admit to having a bathtub (buried in the ground) in my garden. I did some temporary edging around the borders of some largish beds with whatever came to hand, to mark the shape till I got the Real Rocks. A year or so ago. The edging is starting to accrue bits and pieces like your clients’ wall. broken pots and such. I was just sitting out there today for a quiet few mins, me and Rat, and realized I’m really enjoying it just the way it is!